Modified Ericsson KTAS 1914 | Ericsson collectors phone not working. I am no expert on these early Ericsson telephone. It looks to be an Ericsson KTAS and certainly the internal components and external structure appear to be from a period around 1914. It looks like it was modified much later and at a guess would say 1960-70s was fitted with a dial and a remade handset. This looks so well done it would only have been cost effective to have done this if they had a lot of these to do. I would think Ericsson had a large quantity of these in there stores and didn't want to throw them away and so either sold them on to another company or may be even did it in house, To make a handset and fit a dial and re paint would have cost a fortune unless they did a large number. Any information would be good and I will pass it to to the buyer if I get it. This is wired to work and and I have fitted a new line in cord and a 3.3K resistor. The bell works and it receives and transmits OK. I have not changed the microphone or receiver and it dials out quite erratically. Sometimes dialling fine but other time miss dialling. 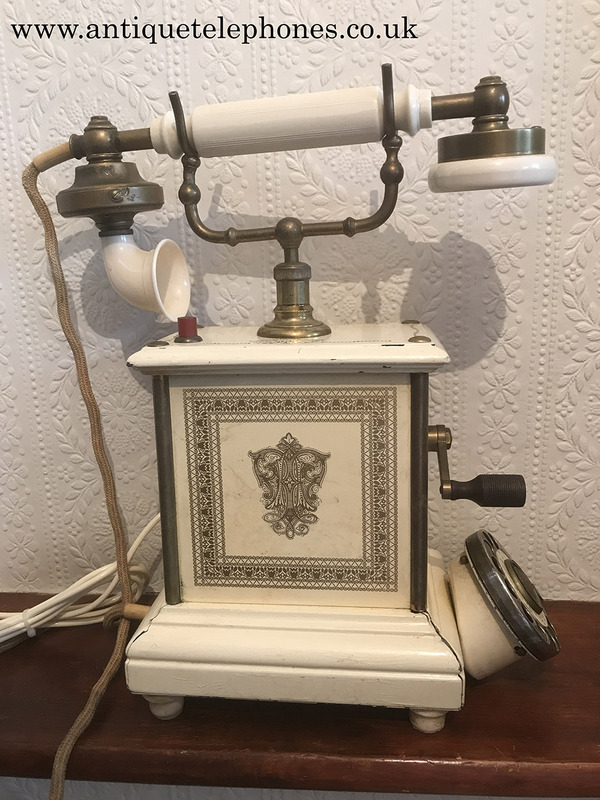 I am selling this as a collectors telephone and not working with no working guarantee. It would be ideal for a collector that maybe wants to research this and possible get it working better. The dial only has only three connections and so not sure how good it would be. Please note this has no guarantee to work and is as found with some paint cracking and repaired ivory ear piece and just as I got it.